Jaipur remains packed with royal buildings and noble haveli’s. Thousands of tourists come visiting every day. And the city makes sure that all these people are fed very well too. Jaipur greets every visitor with a wide variety of tempting and mouth watering culinary delights to opt from. You could choose to hop in one of Jaipur’s well known restaurants like LMB, BMB or Chokhi Dhani to enjoy the traditional Rajasthani thali or head out onto the streets to get a heady slice of the local snacks and delicacies of the state. Having already tasted the authentic thali of the desert state in Khatu, Jhunjhunu and Pushkar, I chose to get a bite of the latter. Continuing from where I left in Flavors of Rajasthan – 1, here I bring some of the flavors I relished in Jaipur, ‘My Favorite Food Stops’ which I have picked over numerous visits to the city. 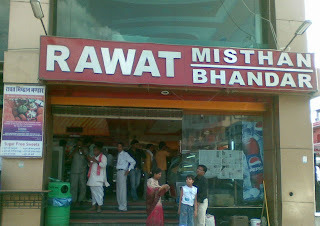 Situated on the Chaura Raasta (Shop No. 273/274), it is a place that is very famous with the locals here. The place is especially known for its Khasta urad dal Kachoris, Pyaaz Kachoris and Samosas. The hot, crispy Kachoris all puffed up and flaky outside, fresh off the kadai. They taste wonderful with the chutneys that they have. It is a treat to watch them make it in front of your eyes. Hot piping Jalebis, the best I have tasted so far, small, hot and very crisp. Situated at the polo victory cinema, close to the railway station and the bus stand, Rawat Misthan Bhandar is the most famous sweet shop in Jaipur. A variety of sweets like katlis, ladoos, barfis, pedas, are all perfectly produced and neatly stacked up in the shop. Don’t forget to try out the local porous sweet dish Ghewar, topped with loads of pistachios and almonds… Wow it tastes so good!! They are mostly made during festivals. Another specialty is their Pyaaz Kachoris and Mirchi Vadas, local specialties of Jaipur, both of them innovative, spicy and very tasty. Situated on the Mirza Ismail or MI road, it is the oldest and the best Lassi shop in Jaipur. Numerous other shops with same names have sprung up in the area. But nothing beats the original! There is no better way to beat that scorching heat of Rajasthan than a cool glass of refreshing Lassi. Served in traditional earthen glass or kulhad, the lassi is sweet, a bit sour at the same time with a thick creamy topping… Definitely makes you feel much better, especially when the temperatures are soaring as high as 45 degrees. After some heavy eating, what one needs is a good digestive. And Jaipur has got these special shops selling a variety of them like hing goli, anardana goli, aam papads, jeera goli etc. lined up in the markets of Jaipur. Besides these, the small hole-in-the-wall shops in Gheewalon ka Raasta and Haldiyon ka Raasta, entire streets dedicated to eateries, and pushcarts spread across the city carry no name as such. But what they lack in name, they amply make up for it in the food they serve and definitely deserve a mention. This is a great posting. I can recognize the Churanwala ..used to buy varieties for my daughters.. Thanks you so much for leaving a comment in my perfectly pink site recently. It's a pleasure to 'meet' you and to browse through your interesting blog. As I scrolled through your photos I could almost feel and smell the delights and sights. Hmmmm, all this lovely food looks so yummy! i love indian cuisine, with chutneys, dals, curries and delicous fried things. Got used to cooking with Ghee - everything tastes better fried in it! Enjoy every bite! The ghewar looks wonderful, wish I could taste it! Such a wonderful variety of everything. Is the pushcart food good, have you had any? Are the sandwiches hot or cold? The street food in India is great, very tasty indeed... In some cases, I would say better than the restaurants!! beautiful blog. Wud love to visit more often. good job. gr8 clicks too!!! Great to read your blog! Especially before our December trip to India, to Kerala. Wonderful shots. I do love lassi! appreciate the suggestion, i hv a friend going in feb will advice them of ur site. I love this post on eateries . I am drooling you know. I love kachoris and when I make the trip I will definitely taste the food from local eateries. Coming to your blog is always refreshing..it is always great to read about the food of a place and how it defines the local culture..lot of those dishes evoked some sweet memories! I would like to try everything! Really great pics too! Stop it, oh please stop it. All this amazing food, you are making my mouth water. Jaipur would be a perfect place for breakfast...your post made me hungry . Would love to beam myself over and share a lassi and some delicious baked thing with you now. Thank you for your sweet visit and have a beautiful day! Great stuff. I remember tasting some of this. yumm mouth watering dishes ...feel like to visit that place.great post arti. hehe. Yum dishes. I love to quell my sugar cravings sometimes ;) but very fattening.